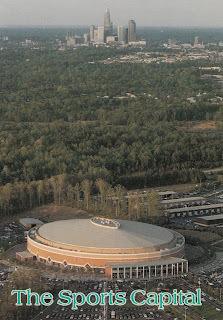 Wow, now a vacant field, here is what the Charlotte Coliseum used to look like out near the airport. The city skyline is a bit different now too! This postcard is from 1989. Interestingly, when they torn it down they did a good job of recycling pretty much everything.